Astronomy, time in its purest form is the source of inspiration for Christiaan van der Klaauw since 1974. 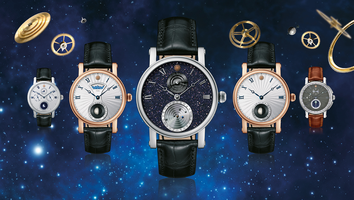 Christiaan van der Klaauw Astronomical Watches is the only atelier in the world that is completely devoted to the design and the production of exclusive, hand-made astronomical watches. Officially listed on the ‘Haute Horlogerie’ White Paper list of the respected Fondation de la Haute Horlogerie (FHH) in Switzerland. The iconic CVDK Real Moon Joure. Collaboration with Van Cleef & Arpels. Astronomical watches, it is our specialism. The number of watches for this collection certainly is limited. They offer amazing hand-made astronomical complications, but also feature innovative ways to show the phases of the moon, the position of the planets and the height of the sun. In this collection you will find watches that turn astronomical complications into astonishing works of art. A retrograde moon phase indication, a celestial planisphere and a dazzling show of the moon’s position in relation to the sun. Compose with our watchmakers your personal watch: the materials, complications, dials, rotors and finish may all be selected in accordance with your personal wishes. Every CVDK watch is rare, but with this collection you will own a unique one.